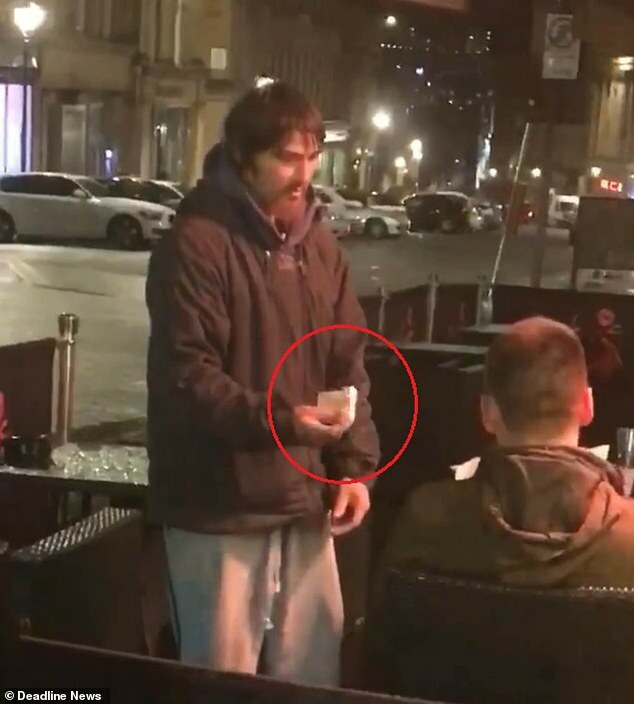 Heart-warming footage shows a 'homeless man' returning a bank card to a customer sitting outside a bar - after the Samaritan gave him his PIN and told him to withdraw £20 for himself. The clip begins with a view of a man sitting at an outside table at Harry's Bar and Restaurant, on Grey Street, Newcastle-upon-Tyne. A bearded man wearing a jacket and jogging bottoms approaches the customer, who then gives him a thumbs-up. The 'homeless' man, who appears to be in his twenties - and may be called 'Colin', according to Facebook comments - hands him a piece of paper and mentions the word 'receipt'. The punter takes the receipt, while the bearded man shows him the £20 he took out. It is believed he made the withdrawal from an ATM outside a Co-Op bank on the opposite side of the road, about one minute's walk away. The two share a warm handshake, and the bearded man begins to leave - briefly turning around to point at the generous individual. The seated man points back, and the two share a friendly exchange, before 'Colin' leaves and the clip ends. The video was shot by Jack Fada, from Newcastle-upon-Tyne, as he took a break from his job as a builder, doing work on a nearby nightclub. The 27-year-old uploaded the footage to Facebook yesterday, leaving viewers in awe at the man's kindness, with over 115,000 users having seen the footage. Above the video, he posted the caption: 'Homeless man goes up to a group of people and asks for money. 'The bloke gives him his bank card and PIN number and tells him to take 20 quid for himself. Facebook users who commented commended the man at the restaurant's kind gesture. He said: 'I was working as a builder demolitioning the old Legends nightclub which is downstairs to Harry's bar. 'I would go outside now and then for fresh air and a cuppa and I see loads of homeless people sleeping and begging, so when I saw what was happening, I started to record.